Some of you may know Thiesel the Alligator from The River of Enchantment, part of The Fairy Tale Project Trilogy. Thiesel recently made his debut on a call box in Dania Beach, South Florida. 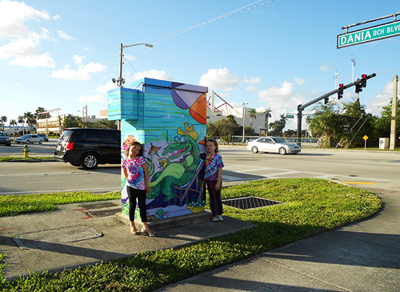 Jacklyn Laflamme’s painting from our children’s book was chosen by the city of Dania Beach to appear on the call box along Dania Beach Boulevard. (If you’re local, it’s between Federal Hwy/US1 and A1A on the beach.) Isn’t he fabulous?! 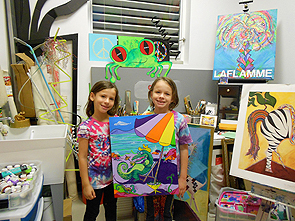 Jacklyn’s original acrylic on canvas painting is hanging in her studio (pictured below). It was quite a surprise when a couple of guests who’d driven by the call box pointed at him and said “I know him!” – – Priceless. This entry was posted in Artist Jacklyn Laflamme, Artwork, Author Dani Lynn, Children's Literature, Events and tagged acrylic on canvas, adventure books, alligator, art, art and culture, artist, author, beach umbrella, broward county, call box, cartoon, children's gifts, children's story, childrens books, city of dania, cowboy hat, dani lynn, dania beach, elves, fairies, fairy tale, fairy tale project, florida, fort lauderdale, illustrator, image, jacklyn laflamme, literacy, literature, painting, public art, sculptures, sketches, thiesel. Bookmark the permalink.